The first trailer for the upcoming movie "Rogue One: A Star Wars Story" is out, and it's awesome. "Rogue One" will take place in the "Star Wars" universe at about the same time as the events depicted in the very first "Star Wars" movie, "A New Hope." 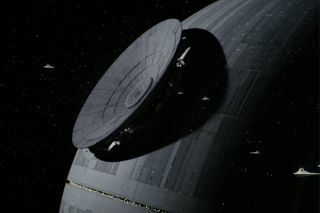 However, "Rogue One" will branch off from the central plot of the original trilogy, and tell the story of a group of fighters from the Rebel Alliance who are tasked with stealing plans for the Death Star, the Imperial Empire's new weapon of mass destruction. You can check out the first "Rogue One" trailer here. Many of the costumes in the new trailer are ripped straight from the original trilogy, and overall, the film appears to have the same gritty aesthetic of those first three films. Other familiar sights include Storm Troopers (in what appears to be a training session) and massive AT-ATs (all terrain armored transport) walkers. Only one character from the original trilogy — one of the rebel leaders, Mon Mothma — appears in the trailer, but people are already speculating about whether more familiar faces will be featured in the movie. Disney Pictures, which own the rights to the "Star Wars" universe, has said that "Rogue One" will be the first in a series of movies that branch off from the central "Star Wars" storyline. That storyline was continued in 2015, with the release of "Star Wars: The Force Awakens," which is also scheduled to be the first installment in a trilogy. And if you can't wait until December for the film's release, Marvel has announced there will be a "Rogue One" comic book released in October.